GDPR is here and if you’re still not compliant, it’s time to act! Not sure how to become GDPR compliant? Don’t worry – it’s not as scary as it looks. We know… we did it. As we’re a small brand, we do not have a data protection officer and did all of our GDPR ourselves. That means hours and hours of research and digging through the fancy GDPR legal wording. You know what’s the toughest part? 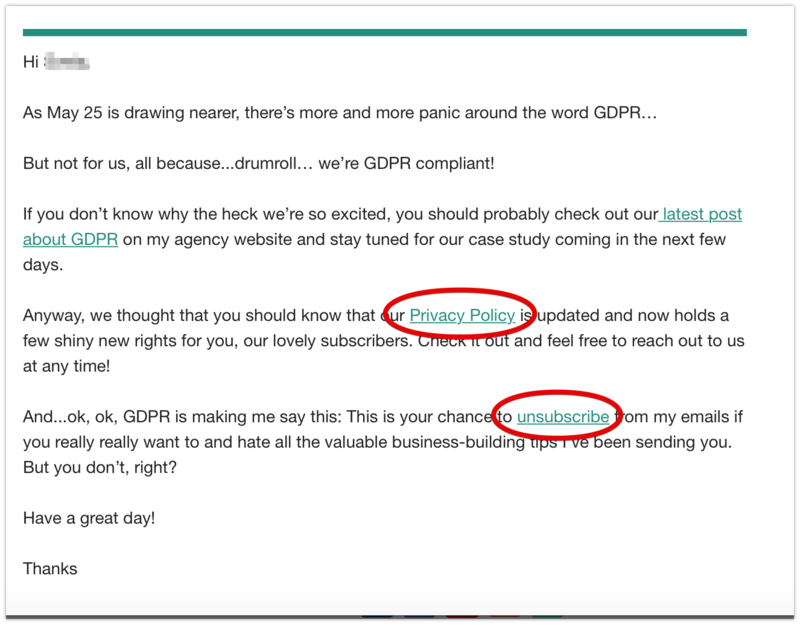 There are thousands of articles about GDPR, most of them vaguely talking about the changes, but failing to share actual steps to take or things to say to your audience. That’s why we wanted to do this post – to share our GDPR experience, in hopes that it can help other brands learn something from our experience and get GDPR-ready in time. Disclaimer: The tips shared in this post are aimed to provide background information to help you better understand how Only Way Online addressed some important GDPR legal points. Do not rely on this article as legal advice, nor as a recommendation of any particular legal understanding. GDPR stands for General Data Protection Regulation and is a new EU law designed to protect the personal data of EU citizens. It might have been created for citizens of the European Union but it impacts thousands of businesses all around the world. 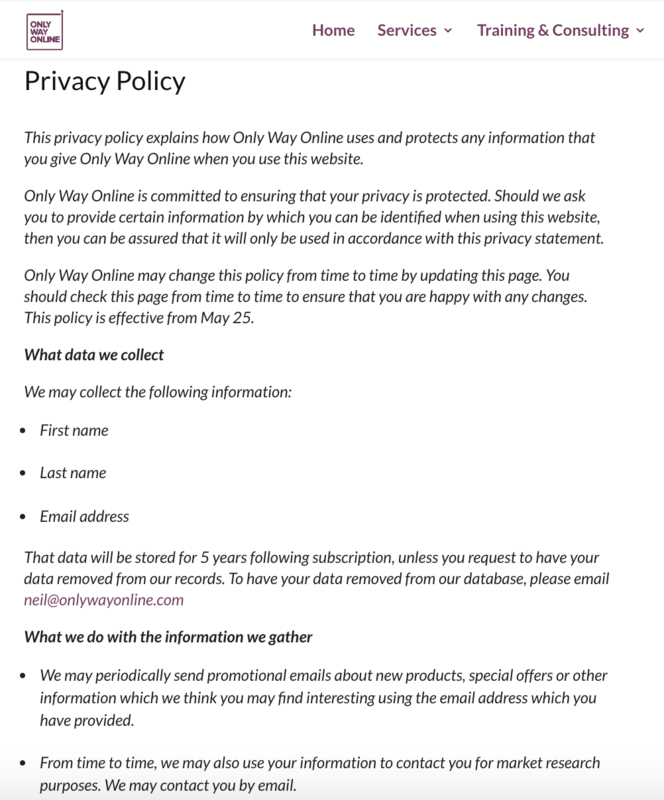 For, even, if you store data for one EU citizen (or have one EU subscriber), you still need to comply by May 25th. If you don’t, your business can be fined more than 20 million euros! For more info about what GDPR is and how it affects us, check out our last post. The purpose of a data audit is to see what kind of data you currently hold and process, and to carry out a revision. You need to know what kind of personal data you collect, where it’s stored, how it’s processed and who has access to it. Upon assessment of our two sites, Only Way Online and Your Brand Found, we concluded that the only data we collect are the subscriber’s name and email address from email opt-ins and enquiries potential customers send in. That data is securely stored in our database and accessible only by our CEO and Content Manager. Because we know that all of our audience is over the age of 18, there’s no need for special data security measures to be implemented. The data audit helped us identify the areas that needed improvement (better data organization and password protection). The next step was de-cluttering the data we currently hold. That meant weeding out all the inactive subscribers. Their data was deleted. The identity and contact details of the controller, and of the data protection officer (if applicable). More info on who is a controller and data influencer right here. The individual’s right to their information (right to withdraw consent, the right to be forgotten, the right to request a copy of all held data). This is the GDPR biggie! You cannot collect or store personal data without getting the individual’s permission. GDPR is much more strict about obtaining consent than the previous data protection legislature was. Previously, consent could simply be inferred from an action or inaction as long as it signified consent. Now, however, the new legislature requires consent to be affirmative, “freely given, specific, informed and unambiguous”. Even if all you’re collecting from your audience is a name and email, you still need them to say they agree to it and are aware of what it means. That’s right! It’s time to say goodbye to the pre-ticked boxes, a simple tiny text notification, or automatic placement in an email list. You can no longer force your audience to consent. So how do you get consent under the new GDPR legislature? 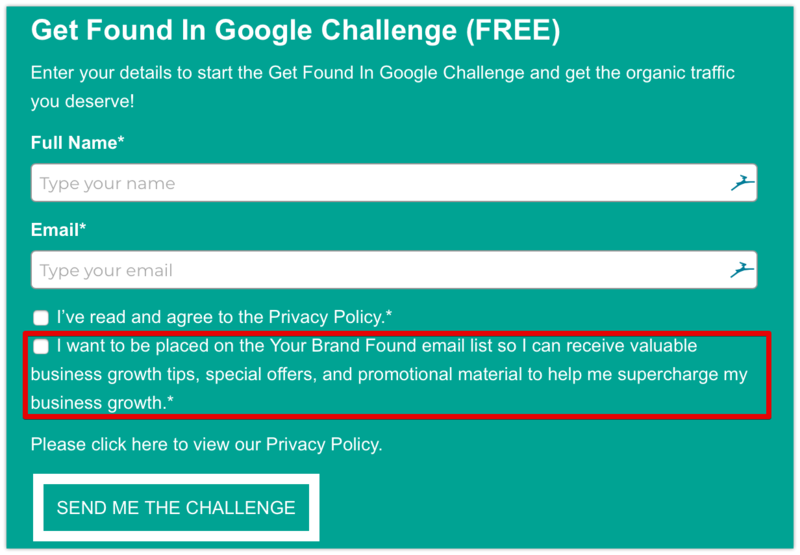 Using a double-opt-in (a form that requires confirmation opt-in). 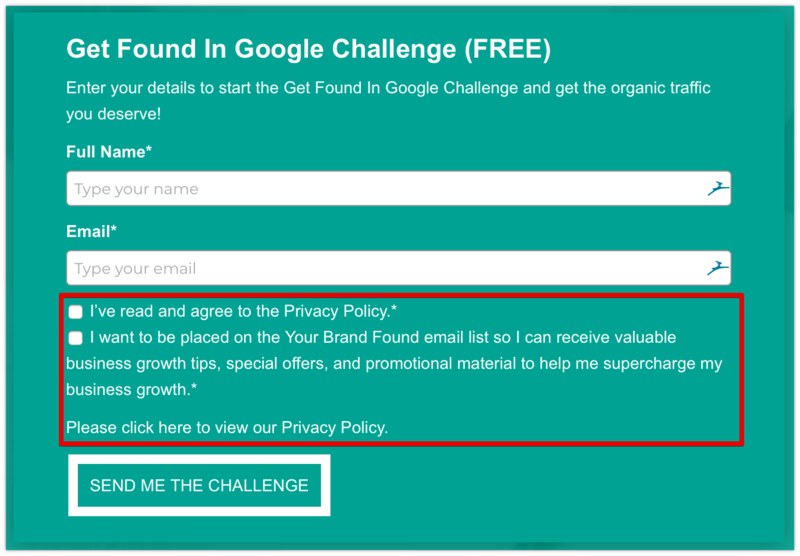 Both are effective and legal, but we decided to use checkboxes to obtain consent on the Your Brand Found site. 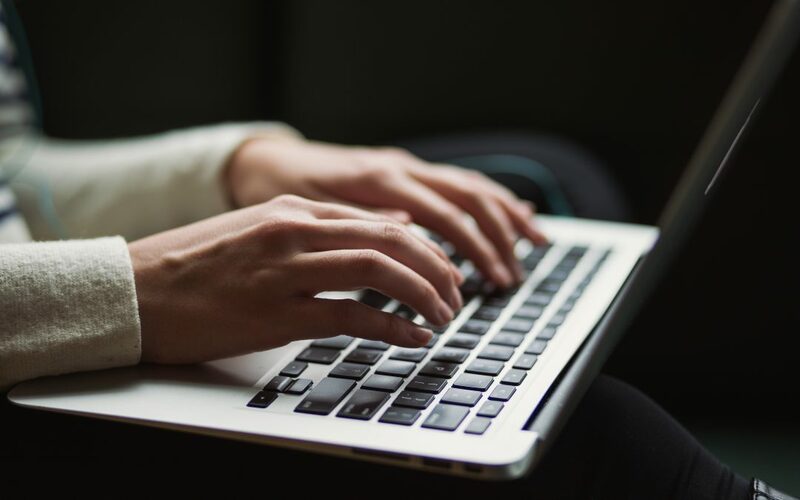 A checkbox the contact must check to give consent for each business activity we employ (in our case – email marketing), with a clear explanation of what they will receive if they submit the form. These boxes cannot be pre-checked. GDPR makes it very clear that the consent must be affirmative, meaning the individual must take a specific action to confirm that they accept. Last, but not least, we made sure we had an automated system in place to collect the consent. That’s because, under GDPR, companies need to be prepared to share a record of consent with regulators, if asked. You need to record the IP address, location, time the consent was given, and text of consent (or a screenshot of it). This was the biggest question: do we need consent from old subscribers? Most articles around GDPR think so. After all, it seems that your previous subscribers never affirmatively consented to you sending them marketing material. And guess what? It paid of! Looks like we can keep our subscribers. Now, bear with me and some legal talk here… GDPR legislature says that direct marketing is usually a ‘legitimate interest’ of the data controller, a non-consent based ground for data processing. So, most of the marketing that is currently done is legal because it’s sent out on an opt-out basis (not opt-in consent). So, if a business’s marketing was never based on consent, there’s no need to seek fresh consent. That choice is up to you. You can have a pop-up that lets users turn cookies on, one that lets them turn them off, and one that has both options. Each is acceptable under GDPR, as long as people have a choice. We chose to give people both options. As soon as a user visits our site, a popup appears that lets them choose to keep the cookies on or off. If the user continues to browse the site after a fair notice, that means we have their consent to keep the cookies on via affirmative action. As for setting up the new cookie notices, there are a lot of services that let you do that, but we used the free Cookie Consent and were happy with it. EU citizens have the right to be informed about the collection and use of their personal data. Companies are required to be transparent about what data they’re collecting, what it will be used for, who will have access to it, and how long it will be retained. It means that people have the right to know whether their data is being processed, and to access their information. Under GDPR, people have the right to have inaccurate personal information corrected. They can make a request verbally or in writing, and controllers have a month to respond. Also known as the “right to be forgotten” this is an all new right, brought about by GDPR. It states that EU citizens can request to have all their data forever erased. This request can come verbally and in writing, and you, as a business, then have a month to carry it out. People now have the right to request the restriction or suppression of their personal data. The request can be made verbally or in writing and must be carried out within a month. If a user restricts processing, a company is allowed to store the data but not use it. However, this right is not absolute and only applies in certain circumstances. This right allows individuals to obtain their personal data from one source to be reused for a different one. Thus, it becomes very easy to move, copy or transfer personal data from one IT environment to another. This is great for the user because they can give that data to services that will get them a better deal. As, the only data we collect is the name, email, and company, we seriously doubt anyone will want to obtain and transfer that data to another source. The new GDPR legislature gives individuals the right to object to the processing of their personal data, and stop it from being used for direct marketing. The request must be made verbally or in writing and carried out within a month. The only way businesses can object is if they show that they have a compelling reason to continue processing data. This right means that GDPR also applies to all automated individual decision-making and profiling. Under this new right, you can only process data automatically if it’s based on the individual’s consent, is necessary for the entry into or performance of a contract, or is authorised by Union or Member state law. If that’s the case, you need to let individuals know their information is being processed, and make it easy for them to request human intervention. It’s also a good idea to carry out regular checks to make sure everything is working. We do not have any automated individual decision-making and profiling. Thus we did not have to worry about this right. GDPR is designed to limit the number of data breaches and to make sure individuals are aware of them, if they happen. Report the data breach to your local data protection regulator. If there’s a high risk to the rights of the people, the company must inform the affected individuals. To prepare for this, we made sure that our entire team was on the same page and knew how to react if a breach were to happen. We also set a processes in place to allow a data breach to be assessed and researched. GDPR, that big scary monster many have been fearing for months, is here. The good news, is that it’s not as scary as it looks. In fact, many of the processes it reinforces are not new – they existed with the old data protection act. But remember – GDPR Compliance is not a cookie-cutter process. Every business is different and requires a different approach. Our goal was to pull back the curtain and show you how we did GDPR. Hopefully, there’s a thing or two you can implement in your GDPR strategy.